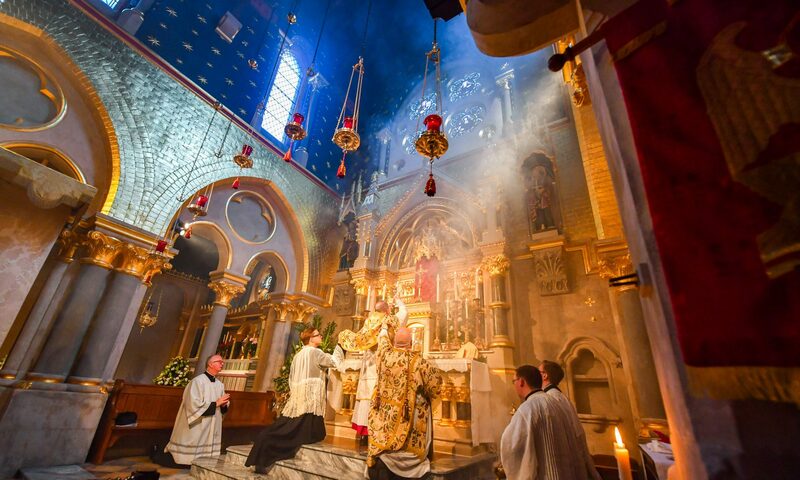 Welcome to the hidden gem of Covent Garden in London, Corpus Christi Catholic Church on Maiden Lane. Corpus Christi is the Westminster Diocesan Shrine of the Blessed Sacrament, and was elevated to this dignity by Cardinal Nichols earlier this year. Built in 1874 as an act of reparation for sins against the Blessed Sacrament during the Reformation and since, the church of Corpus Christi holds a very special place in the hearts of Catholics around the world. The hymns Sweet Sacrament Divine and O Sacred Heart were composed here by a former Parish Priest, Fr. Francis Stanfield and Mgr. Ronald Knox preached his many famous homilies on the Blessed Sacrament from this church’s pulpit. Whether you live in the Parish, or are just visiting London, you will find our doors open all day.